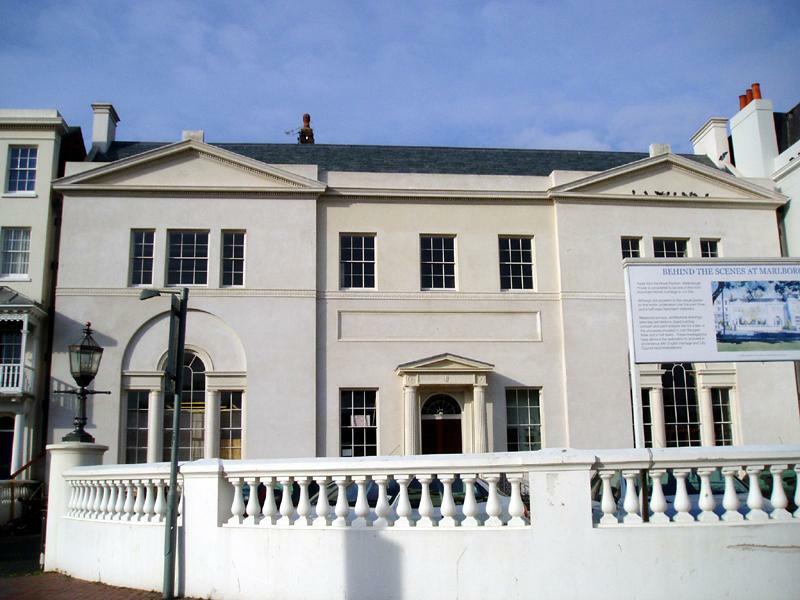 Historically speaking, Marlborough House is Brighton’s second most important building, only rivalled by the Royal Pavilion in its exciting past, and is currently halfway through a much needed makeover. It was built in 1765 on the Old Steine for Samuel Shergold, a local hotelier. The Duke of Marlborough bought it 1771 but it wasn’t until after he sold up that it took his name. Originally the facade was red-brick with five bay windows. It was sold in 1786 to William “Single Speech” Hamilton MP who employed the famous Scottish architect, Robert Adam. His nickname came from it being generally thought that he only ever spoke once in the House of Commons. Adam transformed the then much smaller building into a mansion in which the Tara Palmer-Tomkinsons of yesteryear would have been proud to party. Everything to the left of the middle chimney was added in an extension by Adam. He removed the whole first floor across the front of the building (but not the back) to give double height rooms downstairs – ideal for entertaining. The interior layout is far more complicated than it looks from the outside. External windows and doors were moved to retain symmetry which was expensive but cheaper than building from scratch. This Georgian masterpiece fell into an appalling state but was recently bought from the Council by Brighton-based businessman, Tony Antoniades, who is planning to spend around £1 million on the project. The fireplaces were removed for safety but ironically were destroyed in a warehouse fire last year. This set-back was extremely upsetting for many but the team fights on still unsure of it future usage. With international museum man, Nick Tyson, overseeing the project, you can be sure that the job will be done properly.